Worldview - READY... SET... QUESTION! Do you see the world the way it actually is, or do you see the world the way you WANT to see it? Are you willing to look at evidence in order to build a reasonable worldview, or will you blindly hold on to what you want to be true? Test your scientific literacy and find out, which worldview is true for you! on evidence, science, and logic? blindly accepted a worldview that lacks evidence, scientific data, and is based on nothing other than pop-culture opinion? If you scored less than 8 points on the quiz, you need to ask yourself two important questions. 1 – DO YOU SEE THE WORLD THE WAY IT ACTUALLY IS? 2 – DO YOU SEE THE WORLD THE WAY YOU WANT TO SEE IT? SO WHICH WORLDVIEW IS MOST REASONABLE? ATHEISM promotes belief in ideas that are contrary to science. It also claims that only the material world exists, of which is false because space, time, gravity, and human consciousness are immaterial. 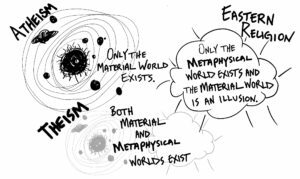 Even the idea of the material world being all that exists is an immaterial concept, showing the simple act of thinking to refute the core tenet of atheism. EASTERN RELIGION claims that only the material world is an illusion and the metaphysical is all that exists. If the material world is truly an illusion, then all written words, including these, would be an illusion and would be perceived uniquely by each individual. If all that existed was immaterial, nothing could be known as truth by more than one person… rendering knowledge worthless. THEISM claims that both material and metaphysical do exist, of which is true because consciousness is immaterial and these words are understandable. Theism affirms the material world through the metaphysical & immaterial process of conscious thought, which is the means of discovering truth that can be known by all people. Can you think of someone else who needs to take this worldview quiz? THEISM is the most reasonable worldview, but what about Polytheism versus Monotheism?